I was totally disappointed by my visit today. I got the steak stroganoff and it was half the size of last time I was there and It had practically no sauce and a couple thin mushroom pieces.The meat was tough and hard to chew. 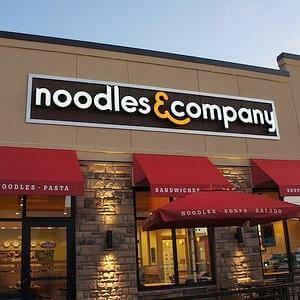 I used to go here alot and loved meeting my sister here but never again. You have changed for the worst. disappointing. I can literally count the pieces of chicken and mushrooms. There were very little tomatoes and spinach. There was plenty of pasta but it was dry and tasteless. We paid $35 dollars for our meal but only one person enjoyed theirs. 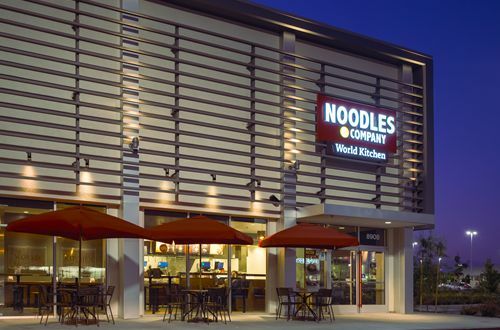 We have always enjoyed Noodles and Company. We especially like taking our grandchildren there. The last visits in recent months to our closest store on Sunset Drive in Waukesha, WI have been very disappointing. The store is extremely dirty. Smells awful when u walk in the first door. Rug and floors look like they never get cleaned. Tables are seldom cleaned. The soda machine and area for napkins, etc is so awfully dirty and messy. There was no salt or pepper today. Really! Hard to believe. The Staff is not friendly nor do they say thank you when u pay. The area where u clear your dishes and garbage is disgusting. Another woman there clearing with me agreed that the store has gone down hill. We will not use the bathroom. We also occasionally go to the store in New Berlin. It is so nicely maintained. Time for someone from corporate to do a bit of checking. Thanks.